I'm having one of those weeks where absolutely nothing is going right. We all have to deal with weeks like that, I guess. Thank goodness I can come into my little room and hide away from reality with my beloved paper. I haven't been able to create as many things as there are floating in the vast expanse of my brain but I got these two out, which provides some relief. Hope you like them!! My goal for this coming week is to read up all I can about being more successful on etsy. Being that there are SO many fabulous shops it's really hard to stand out and be noticed. Let's see what I can learn and put to good use. I used to take ballet as a young girl. It was one of my favorite things. So elegant and beautiful. And so adorable to see all the little girls in their tutu's. Every little girl should have a moment where they feel as pretty as you do in a tutu with a crown and your ballet slippers. **Next week we'll be taking part in a quilling blog hop hosted by Linda from My Quilling Shack. Be sure to stop by to get all the details and hop along with everyone. Have a sweet weekend and stay warm! you blog is one of my favourites to visit. Your work is creative, unique and very inspiring. I can't imagine what you have left in your head to get out. I often struggle with ideas so you are lucky to have them at the ready. I hear you regarding etsy. It is very hard to get noticed among all of the other crafters. Really the only time of year I sell anything is Christmas but that is not enough. The hardest part of being a crafter is finding your market. Good luck getting more sales. I will check back again to see how it goes. Thank you, Cheryl. You're so sweet. 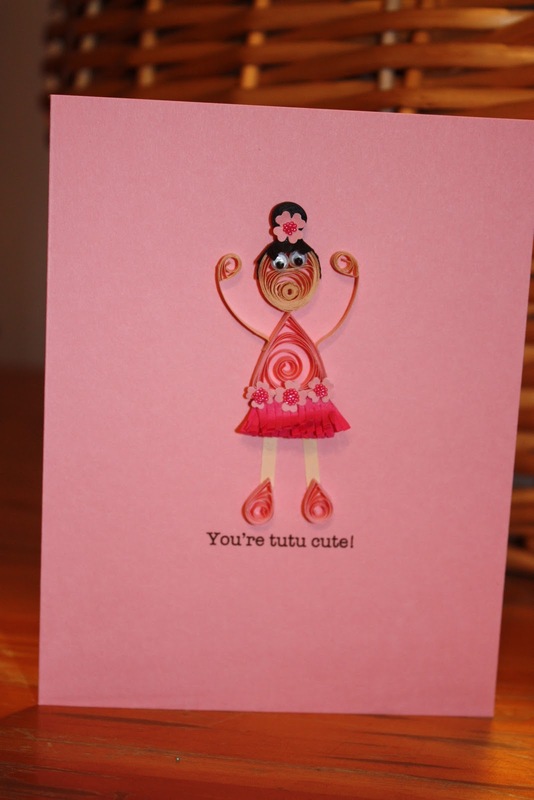 I love to read all the quilling blogs, yours included. It's amazing how everyone interprets quilling in a different way. Thank goodness for the internet where we can all share and be inspired. I wish I had more time to make the entire notebook of ideas I have. But my kids take up most of it. And then there's hubby ;) If only days were a bit longer. I look forward to your future comments!